Finding enough fish to satisfy a whale-sized appetite is no easy task -- but fortunately, some whales know where to look for help. 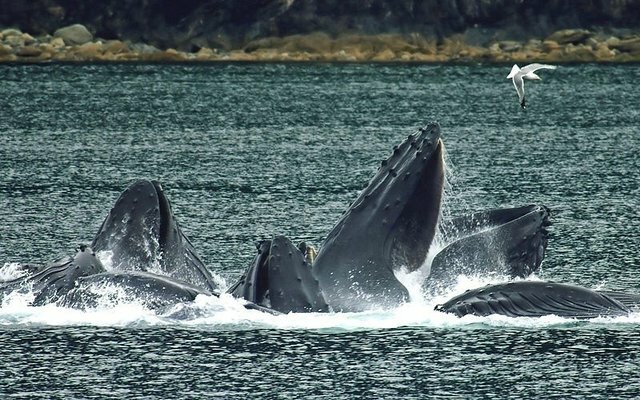 New research has found that Humpback whales along Canada's Pacific coast have developed a unique feasting technique that lets hungry seabirds do the hard work for them. According to fisheries science student Christie McMillan, humpbacks were observed following the activities of birds in the act of hunting herrings, a small, schooling fish. As the birds dive-bomb into the water, the herrings form tight formations called "bait balls" in the resulting panic. The defense response helps keep individual herring from being an easy target for the birds -- but the humpbacks have apparently realized they can easily "just gobble them all" in these balls, says McMillan. The clever whales appear to be quite good at keeping an eye out for their next bird-assisted meals, eagerly hurrying in to get their fill. "I'd look at a school of herring in the distance and think, 'OK, I'll go sample that,' and often the humpback would beat me to it. They'd go over and engulf it," McMillan says. "They seem to be really benefiting from the birds in that area."